I'm noticing that when I fly an LPV from an outer Initial Approach Fix...I get GPS--LPV....switching late....to LPV at the FAF. ..well after I'm established inbound. This occurs even when activating the approach early. With this, the Glide Slope Needle is absent until the FAF..The flight director is the same. As a result I have to catch up..dive down..to.the Glide Slope after the FAF. Contrast this with Vectors to Final...where I get the LPV indication sooner and the GS Needle comes alive 10 or more miles out. My memory is a bit hazy on this, but I think the GPS doesn't switch to approach mode until 2 miles from the FAF. Could that be part if the issue here? Vectors to final gives me an active GS Needle more than 10 miles out...and the LPV Mode Alert is active much earlier. Well, I can point to any number of RNAV LPV approaches where the IAF is a long, long way from the FAF. I don't think you can count on the GS coming alive just because you're past the IAF, especially if there are multiple step down fixes before the FAF. You may have to hit at least the first one yourself, before you get the switch to LPV. Again, I think this depends on the distance from the FAF. I'm still struggling to understand the logic here, and not just for GPS->LPV. 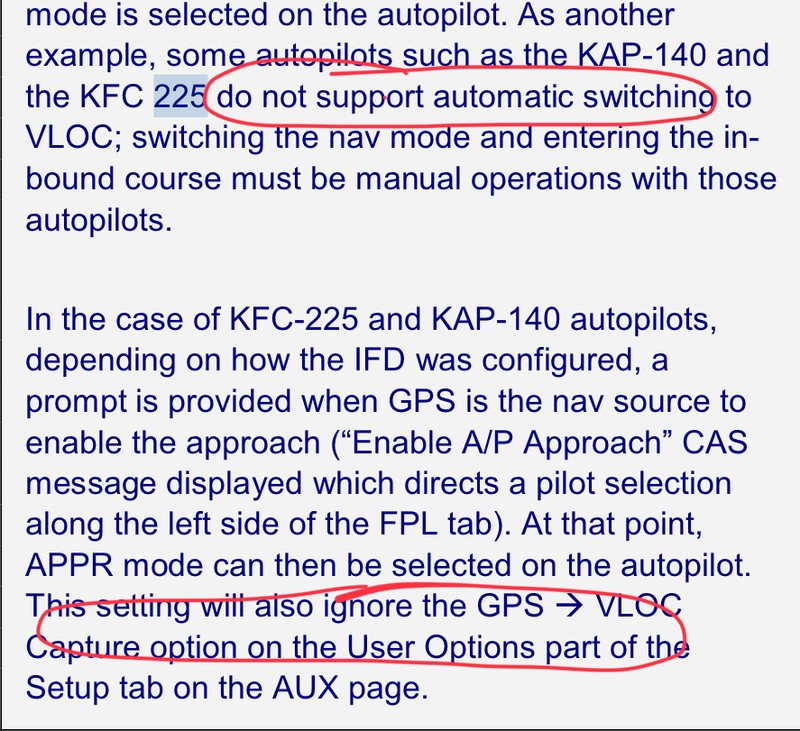 I have the same issue with GPS->VLOC for an ILS approach. I was on an ILS yesterday with VTF and GPS->VLOC showing. I was being vectored to a point just a mile or so outside the FAF at a 25° intercept with automatic sequencing configured and the sequence from GPS guidance to VLOC(LOC/GS) didn't happen until I passed the FAF. Besides your issue about being high, the FAF is very late to discover any eventual issue with a missing glideslope or simply getting a view of the glideslope position. I am told that with Garmin sequencing to VLOC occurs much earlier so there is lots of time to do a proper LOC & GS intercept and confirm presence of both and proper operation. I have now decided to manually sequence to VLOC as soon as I get a reasonable intercept, to force LOC/GS display. Well, the criteria Avidyne uses for the switch to VLOC are pretty strict -- I think there are 5, including morse identified, within x degrees of the LOC heading, etc. Personally, I always switch manually, no later than the final vector if VTF. It is just one less thing to have to check in the scan at a busy time. I can't explain that, but I offer this approach which I routinely fly. The glideslope doesn't come alive until HAROY -- I have to descend from KROWL to HAROY on my own, which is when I get the switch to LPV. As an aside, that's when I put my autopilot into APP mode as well. I flew 2 other full approaches starting from the outer most IAF...everything sequenced appropriately...LPV activated...and the GS needle came alive early enough to be ready for decent. I think the Approach I wrote about earlier has an issue..
Rolfe, the RNAV 03 into 1B1 is exactly as you say, if you don’t begin your descent manually at KROWL you’ll end up above the glide slope when it comes in after HAROY. It is an odd one. Glad to know I'm not crazy! It took some head scratching to figure out to delay the autopilot APP mode on this approach :-). Curious. If you fly VTF, will the GS needle come alive sooner allowing intercept without manually descending before HAROY? It will depend on what altitude ATC has you at and where they have you intercept the "localizer". I’m attending our Duke Fly In in OWB next weekend. 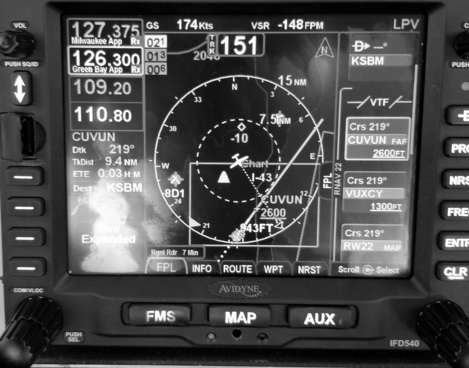 Gary Reeves will be teaching his Avidyne 540 Mastery Course on Friday. I’ll be in attendance. I’ll ask him about our problem. My problem, like yours, occurs on an LPV RNav where the Approach is started at a remote IAF and the Glide Slope needle does not come alive until the FAF. 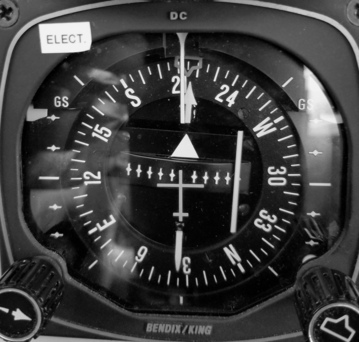 Manual flying of the first leg of the descent is necessary to intercept GS when the needle comes alive. For me, this doesn’t happen with VTF. VTF does everything perfectly. Please send me details of your plane and panel. Note that approaches are not designed for descent on the glideslope outside the FAF. It is possible to have altitude deviations while following the glideslope outside the FAF. The problrm is no Glide slope needle until the FAF...where, unless manual descent was started outside this approach gate, the path is one dot high at the FAF..I agree..descent begins at Glide Slope intercept as depicted by the Glide Slope Needle...There's no needle however until the FAF..so, manual descent needs to be flown until the needle comes alive, hand flying the descent to the FAF MDA..it's using the poor man's glide slope...flying to the MDA of each fix until the GS needle comes alive.. There should be glideslope indications on ILS and LPV approaches well before glidepath intercept. The indication should appear pegged at the top of the case or vertical deviation indicator or whatever terminology you have for the glideslope scale. You should look for when it comes "alive" and starts moving down, but you can't do that if it's not there. Not sure what the problem is, but if you have no glideslope needle until reaching the intercept, there is definitely a problem. Either the box(es) is (are) not working correctly, or any required initial conditions are not being met in time. On an LPV, the GS does not generally appear pegged at the top of the display -- it just appears wherever it is when the box switches to approach mode. Sometimes this is midscale, depending on the approach. it Appears that we now have 2 LPV approaches, one at SBM and One at 1B1, where the GS needle is delayed.. when flying waypoint to waypoint, flying the full approach..with the IFD 5$0. . For me at SBM, Vectors to final fixes this..
...and that's what we're both findind...different aircraft ...different airports....both using the IFD 540... flying an LPV approach from an IAF. ..The LPV activates late...which means no GS needle until the FAF...so GS intercept is not possible unless first leg of descent is hand flown. ..otherwise...at the FAF...when the needle comes alive, altitude is 1 dot too high. I switch to approach mode manually, and always far enough away from the FAF so that the glideslope always appears at the top of the VDI for me. So I'm never so close to the descent point that the glideslope is already on its way down when I first see it. I'd suggest anyone having issues with the glideslope to try to do the same, and see if that helps resolve anything. there is also an autopilot config dependency for auto vloc switching. I have a 225.